to deny the incompetence of the AQE ,Sir Kenneth Bloomfield is not able to rally his school principal troops to rush to his defence. Indeed Portora Royal School and Ballymena Academy, members of the GBA have chosen a verbal reasoning test in place of Sir Kenneth’s CEA. Patricia Slevin of Victoria College has gone much further that Sir Kenneth Bloomfield, patron of the Integrated Education Fund, and has announced that the girls grammar with a similar intake profile will offer both tests! To cap off her integrationist credentials Patricia Slevin has introduced Gaelic games to the genteel ladies school. A fawning BBC reporter even went so far as to tip the school for the McKenna Cup in a few years. A descent into chaos some claim, it now has descended into farce. Ruane’s enthusiasm and determinism and obvious relish in her job as Minister of Education, have added a whole new dimension to Northern Ireland’s gloomy political climate. She has galvanised 11 plus abolitionists. 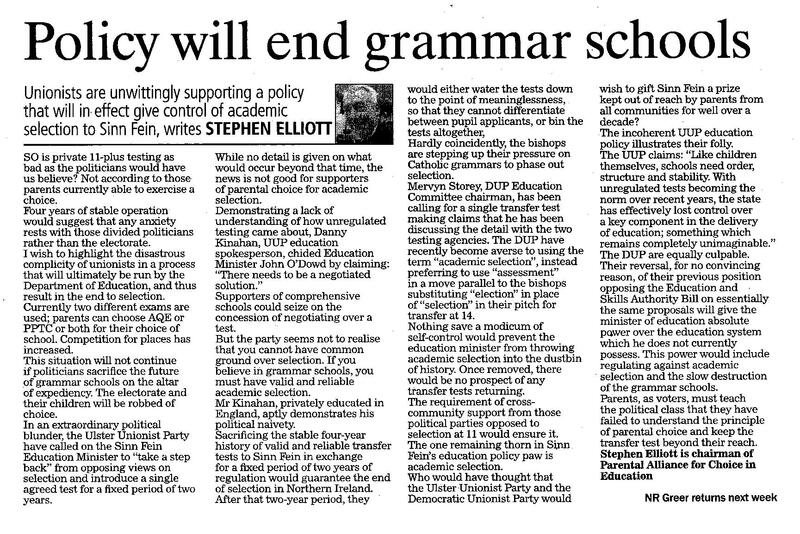 Grammar school lobbyists seem to be in disarray. Association for Quality Education (AQE) president, Sir Ken Bloomfield claims that 31 grammar schools have signed up for an ‘unregulated’ common entrance exam. But as Caitriona points out, entrance tests are nonsense when so many grammars are already failing to fill their quotas – or soon will be. to secure an accurate and complete response from Education Minister, Caitriona Ruane to a question about costs for the CCEA Pupil Profile rumbles on. In an earlier posting about the cost of the Pupil Profile the Assembly question posed by Tommy Gallagher of the SDLP was highlighted. Unfortunately this does not gel with figures provided by the organisation responsible for the project, CCEA. Perhaps he is now aware of his role while a member of the Education Committee in oversight of initatives and projects such as the Pupil Profile, including the expenditure of public funds. Mr Gallagher made contact with PACE and made available copy of a letter received from the Minister citing her latest figures. Unfortunately the figures do not add up again. Parents are likely to be asking: What is behind this latest survey? Or more significantly – Who?